Introduction There is increasing evidence for the use of probiotic bacteria in the treatment of irritable bowel syndrome (IBS). Most reports to date have been in patients with diarrhoea or bloating. The aim of this pilot study was to assess the efficacy of the probiotic VSL#3 in patients with constipation predominant IBS (IBS-C) and slow transit constipation (STC). Methods Patients were recruited from a tertiary referral functional bowel disorder clinic. All patients completed a 2 week stool diary, IBS symptom severity scores (IBS-SSS) and quality of life scores (PAC-SYM) at baseline. Patients received one sachet of open label VSL#3 containing a mixed freeze dried culture of 450 billion bacteria, twice a day for 12 weeks and then completed the questionnaires. Results 45 consecutive patients were invited to participate, but four declined as they had already tried OTC probiotics. 41 patients were studied (21 STC, 20 IBS-C). The mean age was 28.0, 85% were female, with a mean duration of symptoms of 9.9 years. Following treatment with VSL#3 there was a significant increase in mean number of spontaneous complete bowel motions (SCBM) per week see figure (1.0 (95% CI 0.5 to 1.4) p<0.0001). In addition there were significant improvements in quality of life scores (31.4 vs 22.9, p<0.0001) and IBS-SSS (305 vs 269, p<0.0001). Sub-group analysis demonstrated that in the IBS-C group there was a non-significant increase in SCBM/week (0.5 (95% CI −0.3 to 1.2)) but a significant reduction in PAC-SYM score (31.7 vs 22.7, p<0.0001) and IBS-SSS (322 vs 281, p=0.001. 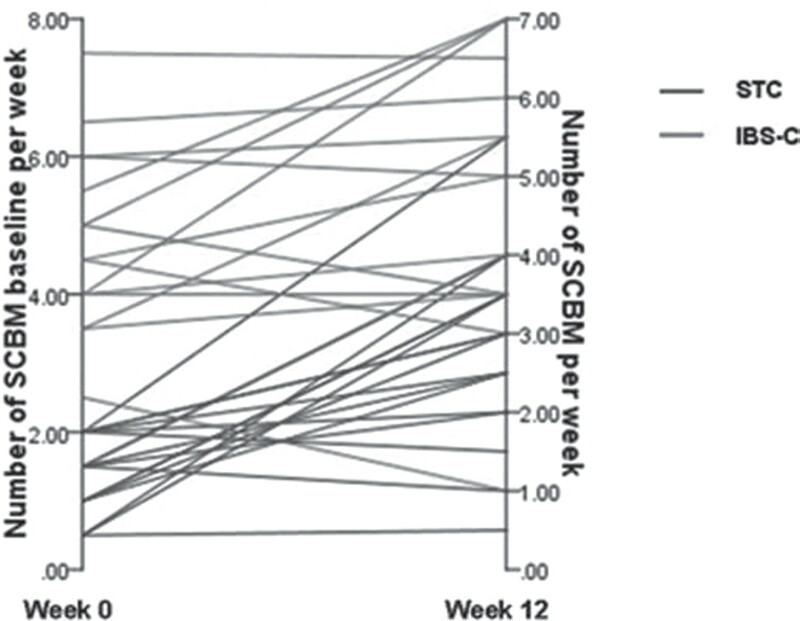 In the STC group there was a significant increase in the number of SCBM/week (1.5 (95% CI 0.9 to 2.0) p<0.0001) as well as improvements in PAC-SYM (31.0 vs 23.0, p=0.001) and IBS-SSS (290 vs 259, p=0.004). Conclusion This open-label pilot study suggests that VSL#3 improves symptoms and quality of life in women with IBS-C and STC. A larger randomised placebo controlled trial is warranted.